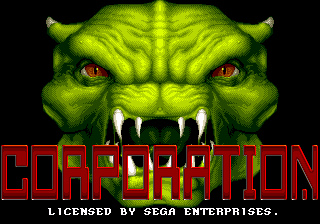 Corporation, is a first person shooter game originally developed for the Commodore Amiga computer by Core Design, before being ported to the Sega Mega Drive in 1992. The North American version of the game was renamed Cyber-Cop for unknown reasons, though peculiarly mentions the original title on the game's cover. Corporation's Amiga release pre-dates id Software's attempts at first person shooters (namely Hovertank 3D, Catacomb 3-D and the more widely known Wolfenstein 3D), meaning it stands as a milestone in the genre. Though walls and floors are untextured, it was the first FPS game to include (primitive) dynamic lighting, and also features role-playing, stealth and hacking elements. Core Design would later produce other attempts at first and third person shooters, such as Soul Star, Thunderhawk and Battlecorps on the Sega Mega-CD. The game was widely praised at the time of release for its display of then-innovative technology, though by modern standards is considered to be a very slow game with difficult control mechanics.